One of the key factors in most images is the use of lines. Are they converging or diagonal, parallel or random? LINES define edges of shape. SHAPES fill space two dimensionally, but don’t show depth. TEXTURE gives depth and relief to shapes. PATTERN is the repetition of shape. And CURVE is a type of line which twists through the frame maybe sharply, maybe gently as an arcing C or snaking S.
Nature is full of these captivating elements of form. 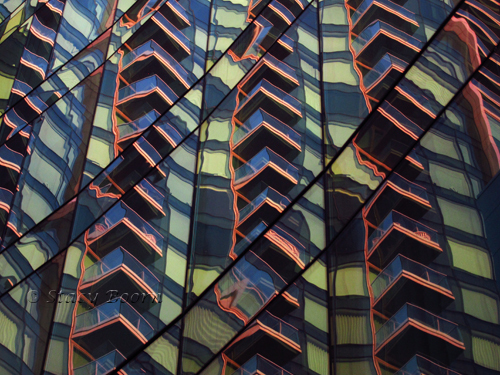 Although, we humans also have the capacity to be creative with our own life evoking lines, like the ones captured in the reflection of the balconies of the Infinity Luxury Complex in San Francisco. Early morning light brings out the multiple colors not seen at other times of the day. The curves of the windows bend and reshape the diagonals of the reflected building. 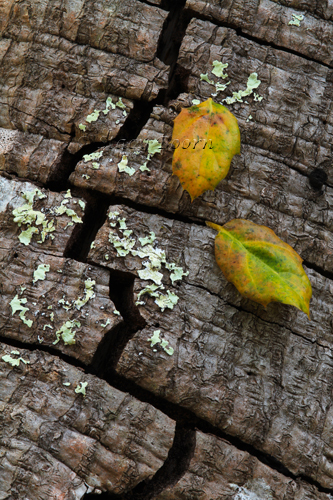 Trees – their limbs, roots, trunks and bark patterns are some of my favorite lines in nature. When no other subject seems to be calling out to photograph it you can always walk into the woods/forest and be surrounded by sharp and soft lines to spark your creative juices. That is the way it was for me among oaks and pine at Point Reyes National Seashore this past week. Unfortunately I was in a group of oaks where many had succumbed to sudden oak death. Several trees had already fallen and others were cracking and losing all their bark. Yet in the midst of the sadness the lines running up and around these once thriving trees were still beautiful. This one particular dead tree caught my eye with its Andy Goldsworthy earthquake like cracks. A wind-tossed leaf was stuck to the trunk. So I picked up another one from the ground and placed it also on the tree trunk for what I felt was a story in detail of what was and what will be for this majestic remnant of the Old Oak Tree! Maybe we need to tie a yellow ribbon around the oak tree for the sake of the oak tree and ask “How better can we love the planet!” Sudden Oak Death is a recently recognized disease that is killing oaks and other plant species in the western U.S. First noticed in 1995, the disease has been confirmed in the coastal areas north and south of San Francisco, and in a relatively remote location in southwestern Oregon. The pathogen responsible for the disease, a fungus-like organism. Creation calls to us for help; the earth cries out for care. The Loving Spirit shows the way to save earth’s treasures rare. Then let us work together now, our gifts to freely share.